Fire pits are often associated with summer nights, warmer weather and cookouts. However, fire pits can easily be utilized year-round as a cozy gathering space for family and friends, no matter the temperature of the weather. By giving a fire pit this holiday season you can give the gift of warm and future memories. Winter does not seem like the most popular time of the year to have gatherings around a fire pit in some areas of the country. However, fire pits do offer a central area that kids can gather around with hot chocolate after an afternoon of snow fort and snowman building or, they can be a spot for adults to sip hot coffee as they converse outdoors under soft, warm blankets for a change of scenery. Plus, there is never a bad time for a delicious s'more or roasted marshmallow. 1. 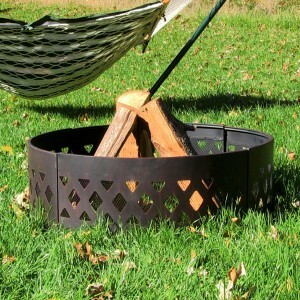 The 36" Crossweave Fire Pit Ring is perfect for a backyard, campground or cabin outdoor space. The crossweave design makes for an attractive look and a breathable fire. 2. 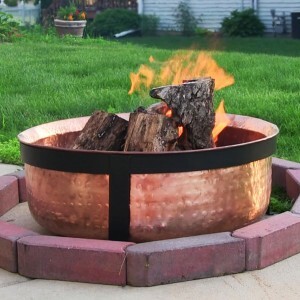 The Hammered Copper Fire pit is large enough to house a roaring fire, yet stylish enough to complement many outdoor decor schemes. It also sits on a sturdy wrought iron stand that is sure to last for a long time. 3. A customer favorite, the Northwoods Fire Pit has an attached access door that makes using it simple. All you have to do is lift the lid and toss in some logs. The fire pit is made to last for years to come from solid steel. 4. 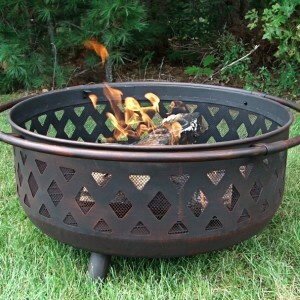 The Bronze Crossweave fire pit is made from durable wrought iron and is engineered to last. This fire pit will add both beauty and functionality to your yard. The 31" fire pit is accented with a stunning cross weave pattern and has a deep bowl that makes it easy to tend and clean. 5. If the gift recipient is a creative, do-it-yourselfer, a heavy-duty fire pit rim that allows the user to make their own in-ground fire pit. Plus, it is available in multiple size options! You can also check out all of our fire pit selections at Serenity Health and Home Decor.